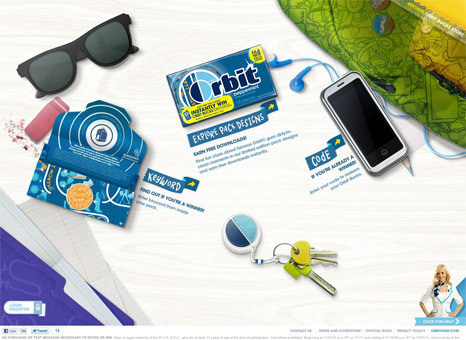 Orbit planned a limited edition range of pack designs to gear students up for back-to-school season. They wanted a site where users would be able to enter codes or keywords from inside the packs to win Orbit Bucks or play a quiz to explore the pack designs. The site was arranged across a desk to organize the various parts of the site. Fun illustrations combined with the Orbit girl to make it engaging. 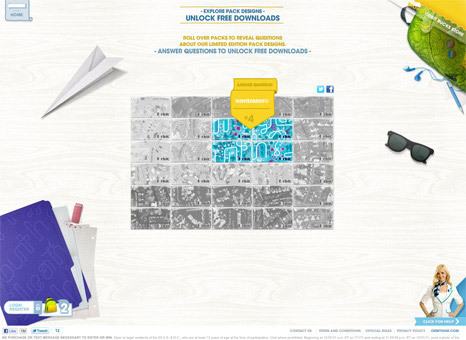 A user chose from "Keyword," "Code" or "Explore Packs" to dive into the experience. The "Explore Packs" section was a mural of all the pack designs. Users could roll over the different packs to answer questions about Orbit. In "Keyword" or "Code" sections, the user was able to find out whether they won a prize or if they could redeem their code for Orbit Bucks. Throughout, the Orbit girl peeked out of the corner of the page, offering tips, tricks and encouragement.